This design forces water to Back Spiral and create Vortex, (Eddy's), in the flow path. Micron particals of Gold will be settled out in the Vortex while the lighter material will be washed and seperated. 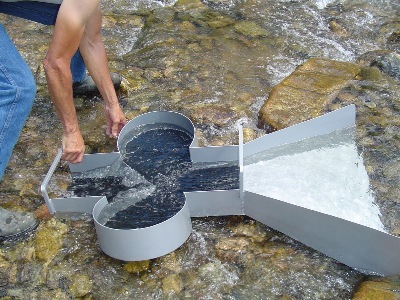 Historically, Sluice boxes have been created in a straight, trough, design with cross bars, (riffles), in the flow path. The riffles cause the water flow current to drop out heavy minerals behind them in a horizontal, pattern. This has always been considered the best possible way to capture GOLD and precious metals. The problem with this design is this: Once the riffles become loaded with other heavy materials such as: Magnetite, Hemitite, Garnet, Mercury, Lead, Etc.....Gold particles will escape right through the flow path of the sluice box. Frequent, Time consuming clean ups must be made to avoid this situation. We have built several models of Side to Side diversion boxes that cause the flow path of the water to back spiral and create a continuous, Rotating Vortex that induces a layering affect. GOLD is deposited directly on the floor of the sluice box as lighter materials continually wash and seperate. This design duplicates natural traps in river beds where there are bends and curves. 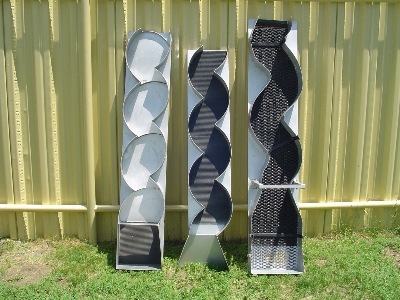 Shown below are (3) models of Sidewinder Sluice...(2) of them are used as Highbanker and Dredge Sluices......They have been tested extensively and they have proven to capture Fine Gold smaller than 100 mesh, (That is Micro Dust). The model in the middle is a 5ft long creek sluice.....It operates with the river's natural current and captures Micron Gold behind each bend....The micro particles settle down into the ribbed rubber mat grooves and the lighter sands are continuously washing and layering by specific gravity, similar to natural sedimentary layers in a river bank. Shown Below is another model of Sidewinder Sluice. We are presently calling this one: Lady Luck......Notice the double reverse curls in the side chambers!....There are several mathematical tricks incorporated into this design to make it function perfectly. We have been building many attachments to allow multiple uses of each model of the Sidewinder Sluices.....Adjustable Stands....Header Boxes with Classifier Screens....Highbanker Feed Chutes....Suction Dredge Attachments....Water powered Shaker Attachments....Easy Lock Down Mesh & Carpets....Etc....We are also developing special attachments for All sluice boxes, That will increase Micron Gold capturing capability simply and affectively. Please keep watching for these specialty items to be shown and offered right here on this website in the near future.